LH Series incorporates a brand new generation and modern style of electric powered / diesel fired hot pressure washers. With features such as rugged 1.25&rdquo; steel tubing frame and stainless steel side panels, these products are ideal for industrial and commercial cleaning applications. They are the most innovative hot water machines in the industry that are made with top quality durable construction that provides years of reliability. Designed with the user in mind, this modular technology supports low operational costs through easy, efficient and effective usage and upgrade paths. 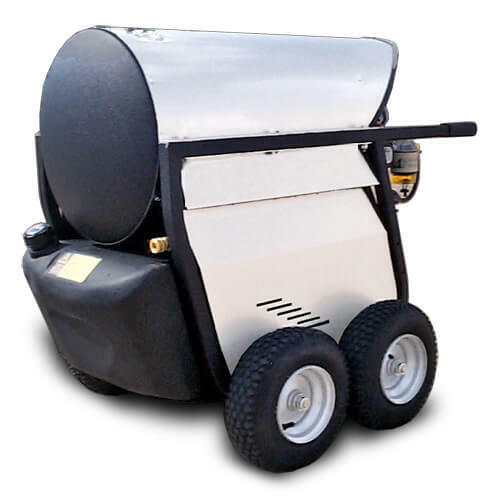 Hot pressure washers are designed and built for performance, dependability and low total cost of ownership. These series come with the cart of your choice of either 4 pneumatic tires or 2 pneumatic tires and a rear support tine. All models are available as direct drive or belt drive machines. Warranty information for these pressure washers is available in this PDF file. If you don't have Acrobat Reader you can download it here. All machines are factory tested before being delivered to the customer. Float Tank with Detergent Metering Valve (this features allows a cleaning solution application under high pressure). CH Series - 3000PSI-4000PSI The CH gasoline and diesel series are the most innovative pressure washers in the industry. With a wide range of engines, pumps, pressure and flow rates available, these products are ideal for industrial and commercial cleaning applications. Designed with the user in mind, the modular technology supports low operational costs through easy, efficient and effective service and upgrade paths. BV Series- 2500PSI-4000PSI The BV gasoline engine series are the most portable and manoeuverable units in the industry. Versatility with features such as interchangeable wheel configurations allows you to accommodate your individual needs. The top-quality, durable construction provides years of reliability, dependability and low total cost of ownership. Download here the Hot Water Pressure Washers Operator Manual.